The design and practical solution to grow your kitchen garden where you want. Childhood memories, desire for freshness, have a kitchen garden is often a dream in our urban areas. Hurbz made it happen ! Its contemporary design will immediately integrate your balcony, terrace or garden. With the KIGA kitchen garden, grow your vegetables, fresh herbs or small fruit trees with style. A simple and modern design. Its design has been created to integrate with your outside and make it better. 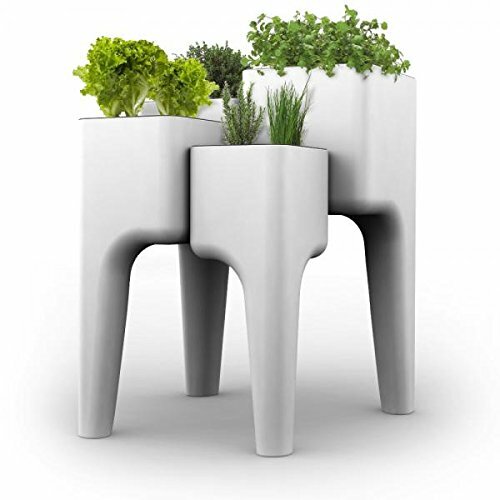 KIGA will fit right on your balcony, terrace or even in your garden. Ease of set up and use. Mounting the table is KIGA extremely simple since it's only 4 bolts to tighten ( supplied). In addition, the height of the containers will allow you to work without having to bend down and preserve your cultures from pests. One product, two possibilities. The KIGA table offers two mounting options. The first as table, in square. You can also align the elements KIGA and lean against a wall. If you have any questions about this product by Hurbz, contact us by completing and submitting the form below. If you are looking for a specif part number, please include it with your message.